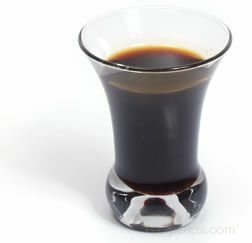 A traditional Middle Eastern ingredient made from the sugar in the juice extracted from fresh pomegranates. Thick and syrupy in texture, pomegranate molasses provides a sharp, tangy flavor when added as an ingredient to food dishes. It is typically used to flavor chutneys, curries, salad dressings, sauces, or marinades, and may be used to glaze or tenderize meats such as pork or lamb. It is also a common topping for some desserts as well as a savory filling for breads and pastries. 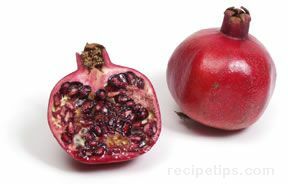 To make 1/2 cup of molasses from pomegranates, lightly heat 4 cups of juice in a pan for 45 minutes or so, allowing it to thicken but not overcook, which produces a dark sap-like mixture instead of a smooth slow flowing molasses. 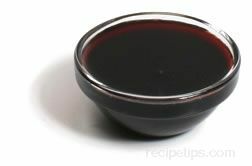 Pomegranate molasses can be stored in an airtight container, refrigerated for 3 months or so.